As the largest sand island in the world, stretching for 122 km along the Queensland coast, Fraser Island undoubtedly lives up to its World Heritage status. Fraser Island is most commonly recognised for its perched freshwater dune lakes, dingo population, high sand dunes and the unique phenomenon of extensive areas of tall rainforest growing on sand. The Australian Committee for IUCN Inc. (ACIUCN) was founded in 1979 to provide a focus for Australian member organisations of IUCN (International Union for Conservation of Nature) and organisations with primary interests or responsibilities in nature conservation to support IUCN’s global mission for ‘a just world which values nature’ within Australia. 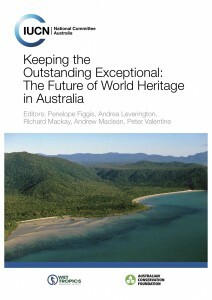 To contribute to the conservation and restoration of the natural environment in Australia and the appreciation of its diverse values by providing a forum for Australian members of the International Union for the Conservation of Nature and IUCN Commissions that brings them together in an equal and constructive partnership to exchange information and views and, through consensus, to develop policy advice, publications and actions to promote ‘a just world which values and conserves nature’ in accordance with the mission and policies of IUCN.